The Bouma Group Gives Back! 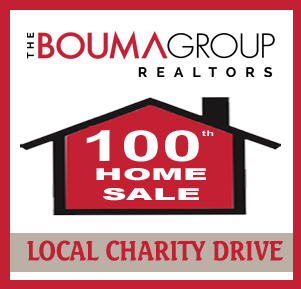 The Bouma Group will donate the commission dollars from our 100th home sale to a local non-profit charity chosen by the community. You can participate too! Click the logo above for information on each charity and to vote for which you think should receive the donation. And remember, you can vote once a day for the duration of the drive! On June 5th, 2015, the final results will be announced! The top charity with the most votes will receive up to $6,000, based upon the sales commission dollars from our 100th home sale. The next 2 charities will receive up to $1,000, and the final 3 charities will receive up to $700. You Could Be Our 100th Closing! Have you been thinking of selling your Ann Arbor Home? It could be our 100th home sale! Call us for details at 734-761-3060 or email info@bouma.com to find out how!